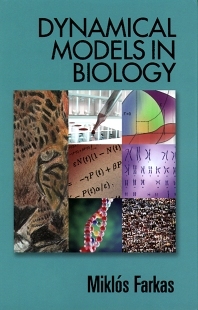 Dynamic Models in Biology offers an introduction to modern mathematical biology. This book provides a short introduction to modern mathematical methods in modeling dynamical phenomena and treats the broad topics of population dynamics, epidemiology, evolution, immunology, morphogenesis, and pattern formation. Primarily employing differential equations, the author presents accessible descriptions of difficult mathematical models. Recent mathematical results are included, but the author's presentation gives intuitive meaning to all the main formulae. Besides mathematicians who want to get acquainted with this relatively new field of applications, this book is useful for physicians, biologists, agricultural engineers, and environmentalists. Miklos Farkas is a professor at Budapest University of Technology where he has researched and instructed mathematics for over thirty years. He has taught at universities in the former Soviet Union, Canada, Australia, Venezuela, Nigeria, India, and Columbia. Prof. Farkas received the 1999 Bolyai Award of the Hungarian Academy of Science and the 2001 Albert Szentgyorgyi Award of the Hungarian Ministry of Education. Miklos Farkas received his Ph.D. in applied mathematics at Eötvös Loránd University of Budapest. He has been a professor of mathematics for over 30 years and has published a number of books and nearly 80 research papers. His research interest include stability theory nolinear oscillations, bifurcations, and population dynamics. He received the Bolyai Award of the Hungarian Academy of Science in 1999.